"The Hand of God" is perhaps the most enduring of Michelangelo's paintings. Almost five centuries later this image remains prevalent and is still being used in adverting and on posters and T-shirts. This is particularly true of the detail that shows the two hands as they reach towards each other, tantalizingly close, almost touching. The panel illustrates the moment when life is instilled in Abam by God. 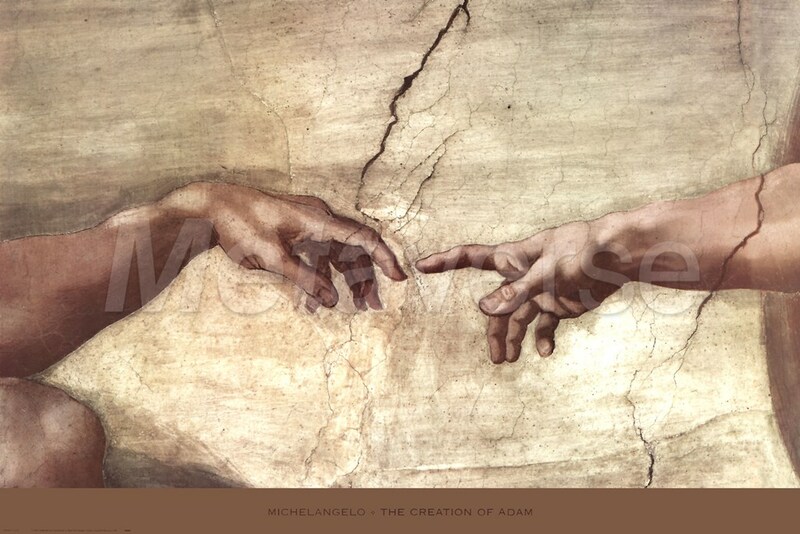 Michelangelo has placed the central focus upon the hands of Zgod and of Adam, not just by the placement of the figures, but also by the two outstretched arms. Adam, who is only half-sitting up against the mountainside, seems weak and lanquid, with his arm resting upon one bent knee as if it is too heavy for him to hold up without some support. The hand is limp, the fingers are drooping as if they are without energy, awaiting the vital spark of life.